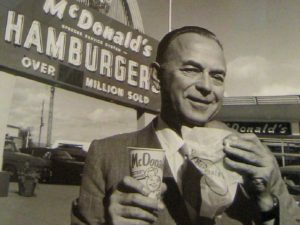 Ray Kroc didn’t need goals to become one of the most successful businesspeople of all time. The Founder is a film that was released recently. I haven’t seen the film yet (I’m more of a wait to watch it at home kind of guy). But after seeing the trailer I became fascinated with Ray Kroc. Ray Kroc was a lifetime salesman. He sold everything from paper cups to underwater lots in Florida to milkshake machines. Oh, and he eventually led McDonald’s from one restaurant to the company we know today. So after seeing the trailer for the film I ordered a used copy of Ray Kroc’s 1997 book, Grinding It Out. It’s the story of his life and that included his life with McDonald’s. He stumbled on the restaurant in the ’50s (while he was also in his 50s) and he was taken aback by the system the McDonald’s brothers had created. it was extremely efficient and productive. Kroc fell in love with the restaurant and formed a partnership with the brothers to franchise it across the country (and eventually the world). Things got a little shaky with the relationship. Kroc had a thirst for growth while the brothers were more conservative. It’s probably safe to say that both sides needed each other to succeed. Kroc needed the brothers’ system and they needed his ambition. Anyway, there were some really interesting things that Kroc had to say about life and success including his take on goals. One of the really interesting things about Ray Kroc was that he said he never set goals. Well, I think he did kind of have an idea of what he wanted in life, but the more you read about him the more you realize that he really didn’t think about goals that much. He simply continued to work and move forward. I don’t think he ever said it necessarily, but he seemed to be a big believer in the idea that humans are like flowers. They’re either growing or wilting. Ray Kroc wanted to keep growing. He continued to move forward even well into his 50s when he started his work with McDonald’s. Ray Kroc had a fondness for systems. Throughout his life he was almost always working on some kind of system. He would work on his own sales techniques and strategies. He had sales teams at his various jobs. They would sit down and brainstorm about ways that they could sell their paper cups to new customers. And when they were working on these sales ideas they were usually thinking about how they could turn the effort into a system. What’s the key to a business system? A system can apply to just about anything. All a system does is go through a series of steps to accomplish something. Ray Kroc and his team would figure out the steps to find customers, form a relationship and make a sale. But they didn’t stop there. They were always looking for improvement. They were always looking for ways to find more customers. To find better customers. To make the process faster and more efficient. That’s why it seems that Ray Kroc fell in love with McDonald’s so much. They were kinds of the fast food system. They really were the creators of it. It wouldn’t seem to be that difficult to sell someone a burger, fries and a shake. But the McDonald’s brothers figured out an elaborate system to made excellent burgers, fries and shakes and that delivered those items to the customer incredibly fast. Ray Kroc didn’t believe in goals. He wanted to get better every day. He didn’t put a limit on himself with a goal. He just improved every day and let things play out. There is no way Ray Kroc could have set the goal to be the founder of the biggest fast food company in the world. That wasn’t a thing. But Ray Kroc loved systems. He understood the power of systems and how they lead to improvement. What are the systems that drive your life? Are you improving because of them or are you falling behind? Build systems into your life and business. And always look for ways to improve your systems. That was Ray Kroc’s secret to success. And it can be yours too.